The 2019 Photography Exhibit is coming April 15th-May 15th! You can start dropping off your photos beginning April 1st. Explore More Illinois is a cultural pass program that allows Illinois public library cardholders access discounts at museums, park districts, historical societies, zoos, arts centers, recreational facilities, and other attractions. 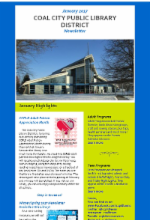 For our monthly newsletter of events and programs emailed directly to you!